The world of architecture might just be about to get a little more exciting – and malleable – with the advent of a new 3D shape-shifting material that can support thousands of pounds in weight. Researchers at Harvard University have created an origami-like foldable material that gains stability not from its composition, but from the shapes it can expand and contract into. The development opens up the possibility of mutating buildings and pop-up emergency shelters, as the material can be instantly folded flat for easy transport before transforming at the flick of a switch into a multitude of shapes and sizes. According to the creators, the “metamaterial” is tunable in “shape, volume and stiffness,” and could even support the weight of a fully grown elephant. The material is based on a form of origami known as Snapology, a design concept that involves folding paper into 3D geometric shapes. The design has a range of potential applications, from future space homes to emergency tents and medical equipment. 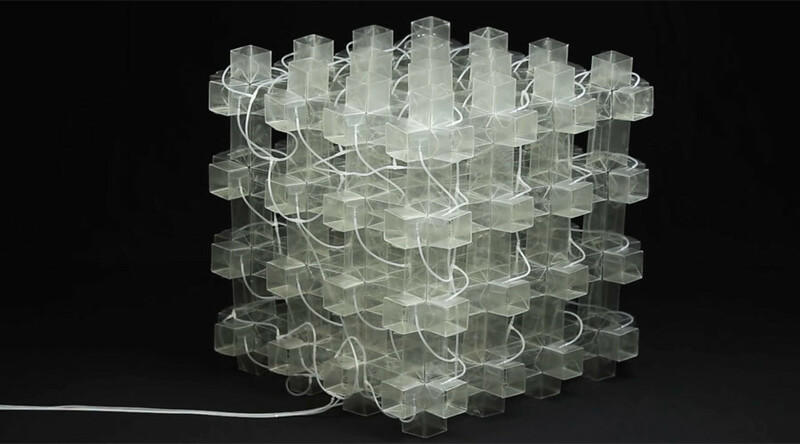 The interchangeable, cube-like structure consists of 24 faces and 36 edges with hinges that are manipulated remotely. It has yet to be given a really cool name, but a mesmerizing video showing the strange material ballooning up and then shrinking shows just how versatile it could be.